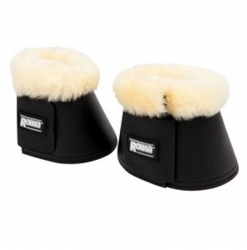 These bell boots are trimmed along the top with quality Merino Sheepskin, for added comfort for your horse. They&apos;re soft neoprene covered in PVC for extra strength and durability. The adjustable touch tape closure makes for an easy and secure fit.